Intelligent Nest’s understand the importance of offering, rotating, displaying and maintaining toys for their children to engage with as they complete their daily work- learning through play. But the reality of toys everywhere, with missing parts, scattered on the floor and throughout every room in the home can feel like an insurmountable problem. Be encouraged in your devotion to creating a livable-learning environment at home. It can be done and you do not have to trade your sanity for your Intelligent Nest. The answer to your organization conundrum is toy depots. A toy depot is a basket or a nook that works as a temporary holding place for toys until they are transported back to their home base. Baskets make wonderful toy depots. 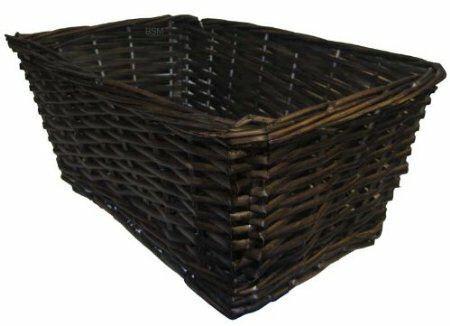 Use baskets in each main living area of your home. Place one by the entrance to each set of stairs or main hallway. If you find a toy that does not belong in the area, deposit it in the basket. 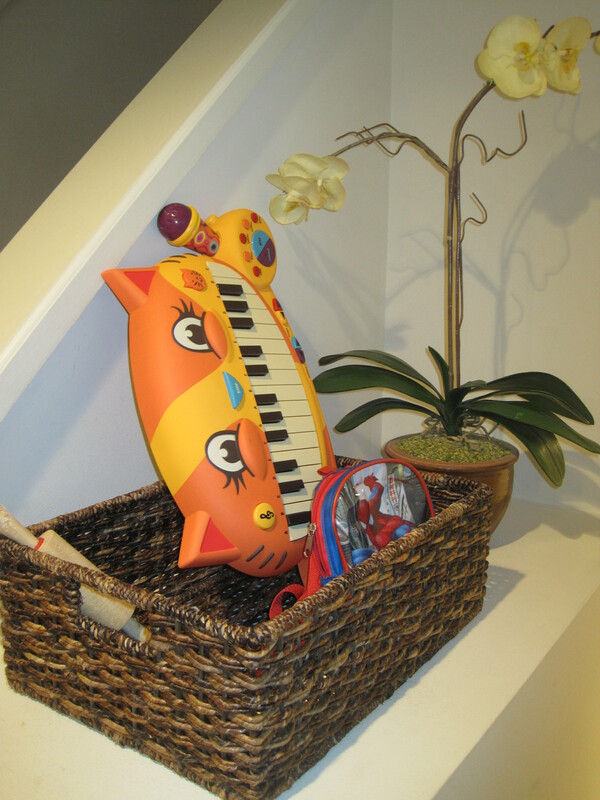 Next time you are headed upstairs, peek in your basket and grab the items that belongs upstairs. If you do not have time to take the toy to it’s final destination, deposit the toy in the upstairs toy depot until time permits. The toy is at least contained and closer to its home-base, making it less likely that it will get lost. Even if you are holding a child on one hip, you can usually still grab an item or two on your way up or down the stairs. Here is my toy depot located in the main living area of our home. It is neatly tucked between the staircase leading upstairs and down. Throughout the day, I constantly pick up toys and other things that are not being used and are out of place. Instead of feeling pressure to find the toy’s proper home in the moment, I pile them up in my toy depot. When I head upstairs or downstairs, I make a point of grabbing something from my basket that needs to go to a different level of the home. Placing baskets in every area that I want to create a toy depot is not always practical or attractive. 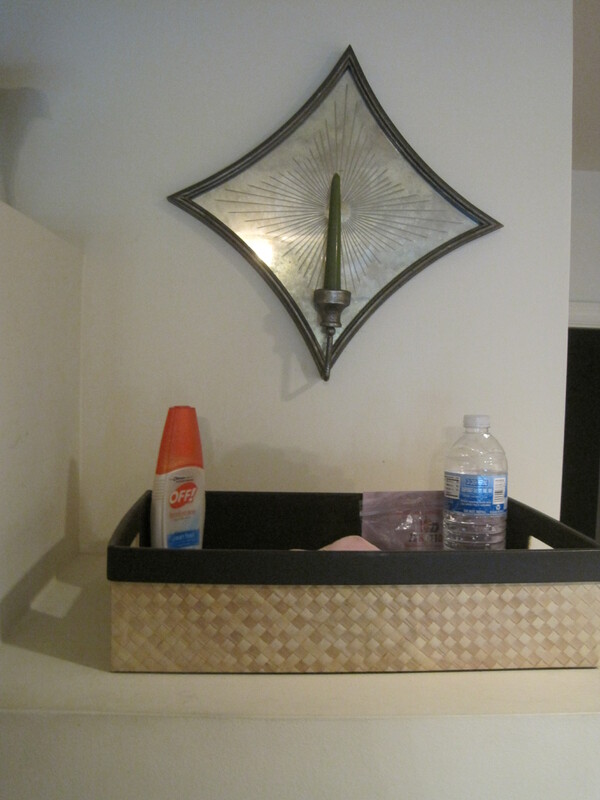 In this case, I designate corners or nooks as toy depots and only place items in them that need to find their home base. Young children will scatter their toys throughout the home as they play. They do not always see their toys as sets that belong together. They see pieces and parts, which transform into individual toys at times. 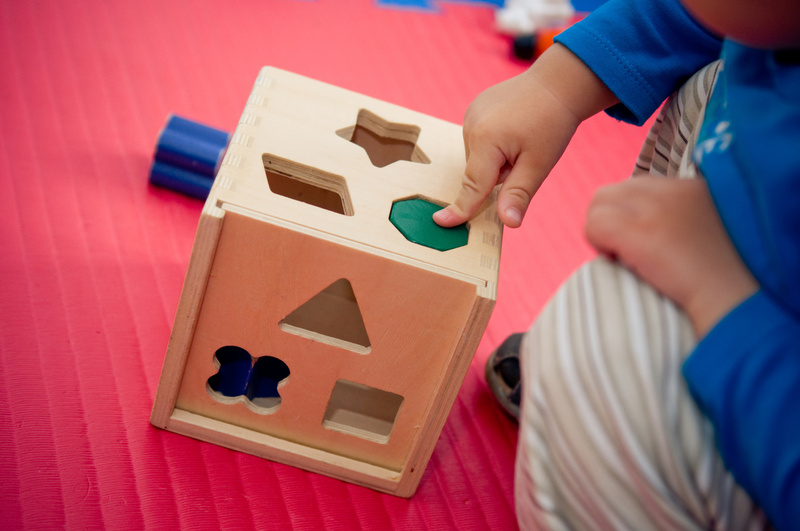 A shape puzzle (as shown above) works well when all the shapes are present with the wooden container, but toddlers may find other wonderful uses for the shape blocks and you may find them hidden in their play kitchen because they served as pretend food or you may discover them inside a backpack because the blocks became rescue supplies for your child’s latest mission into the jungle. Separating toys from their sets is a wonderful sign that creative play is occurring. Creative play is important as it requires a child to think at a deeper level. Try to avoid discouraging the scattering of toys. Occasionally, you may choose to require that a set of toys stay together because it is too laborious to collect all the small pieces. Other times, with older children, you may require the child to be responsible for returning all the pieces back to the set’s home-base. As a final option, use your toy depots. When a child is finished playing with the various pieces of a toy set, pick them up and throw them into a toy depot. Return the pieces to their set when you have a chance. Their is no risk in loosing all the pieces while you wait because they are contained in their toy depot. Using toy depots not only works to keep your toy sets together and your play-area neat and tidy, they also teach your child organization skills. 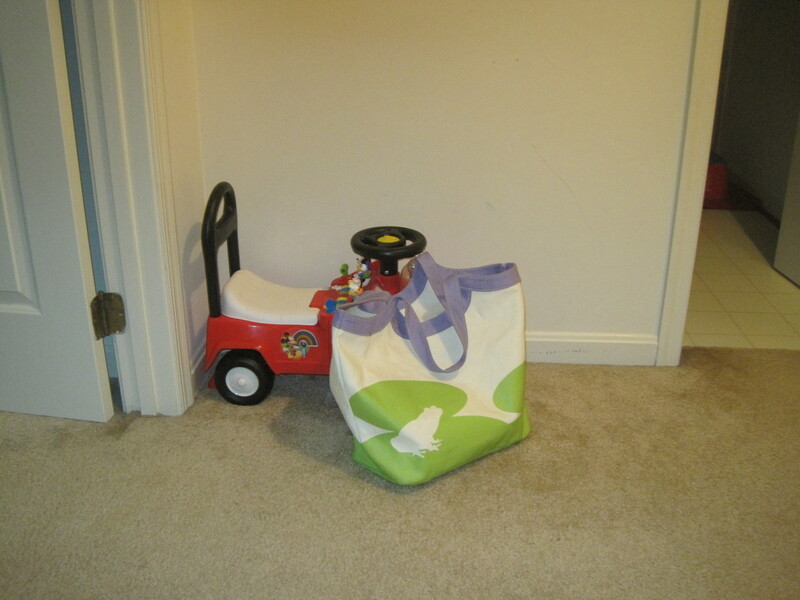 Children quickly learn that when something needs to be brought to another part of the home, they can begin the clean-up process even if they are not able to fully deliver the toys to another area of the home at that moment. A child absorbed in play will be more willing to deliver the set of maracas that belongs in the music box upstairs if he only has to take it as far as the toy depot at the bottom of the stairs. Children also learn that if they are missing a toy or its parts that they can check the toy depots. In most cases, the most valuable use for a toy is its intended use. Using a toy according to its intended use requires that all the parts and pieces are present and accounted for. What good is your Candy Land game without the lollipop card or your race care set without the main piece of track? Allow for creative use and scattering, but try to squeeze all the play out of your toys by returning all the parts and pieces at the end of the day or week before they become lost in the great abyss. This is the main reason that I discourage the use of toy boxes with clients and encourage the use of toy depots. Toy depots makes it easy to allow a bit of scattering, while still keeping toys intact.